Each May in the United Kingdom, the Campaign for Real Ale encourages beer drinkers to hit the pubs and enjoy pints of mild ale. Here in the United States, mild ale is practically a forgotten beer, lost in a sea of strong hoppy ales whether pale, amber, dark, or otherwise. American Mild Month is about encouraging brewers and drinkers alike to discover the delights of mild, perhaps the single most neglected beer style in the US craft beer scene. But how do you know if you are drinking mild? Mild is traditionally an English style of beer, and back in the mists of time, 'mild' simply meant that the beer in your glass was young, yet to be ravaged by the onset of age and to become 'old'. These days though, 'mild' generally means a low alcohol beer that is generally dark and very much on the malty side, though pale versions do exist in the UK. …we are looking at broadly similar beers, malt to the fore, hops in the background, and drinkability a key feature. Free Bloomin Onion at outback steakhouse tonight because some NASCAR driver won something. 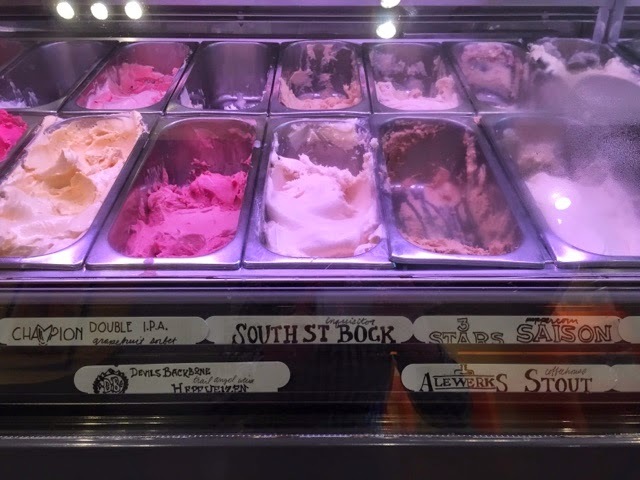 Beer gelatos at Splendora's this week. …but hopefully without the ew-I-see-what-happens-there-at-night-I-would-never-eat-there scuzziness. Was: Worse than Liz's friends from high school's home brew that they brewed in the closet and served in old 7-up bottles. Then they got a new brewer. That was a few months ago. The Know Good Beer winter festival is this weekend at the IX building and IX art park. $30 for twelve 4 oz pours, and you can buy 4 pours at a time there for $6. The admission price is $7.50 per 12 oz. $7.50 for a can of beer is not special…if they actually limit their pours into your free half pint glass to 4 oz (hint: half-pint is 8 oz). And it's day drinking. Outside. And art.